Run: It got cold since last night. I was going to run to get to 30 miles but having been out the whole day, I just couldn’t bring myself to get back out there in the cold. More on this why I was out. Instead of running, I had a cross-train day. My friend and I hit the trail over the weekend to test out our camping gear. She got a new pack and I got various new stuff. 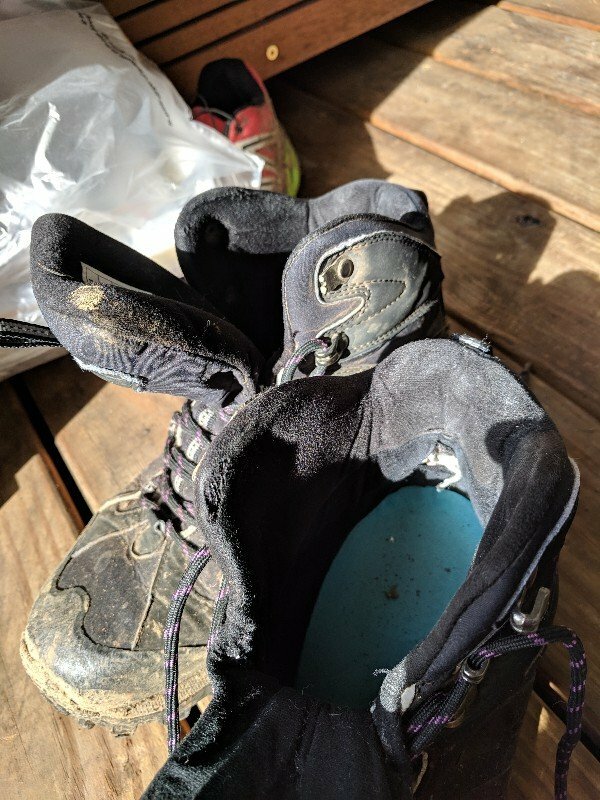 I found out why I was having blisters on my heels on the last two hikes. It dawned on me not because my socks but my boots were given me blisters. My boots were worn. The fabric was torn where my back of my heel is. The hole rubbed against my foot. I was thinking of using duct tape to tape it up. But I got a new pair! The mileage was to be low at 10 miles range. There is an overlooked up on the mountain. Another thing I got was a warmer sleeping bag. This would be my first /second winter camping trip. Last time I went, I didn’t know how cold it can get outdoor. I had supposingly a 32 degree bag but in reality it could do was around 40-50. I didn’t freeze to death but it was sure a cold night, in which later I learned was around 20-25 degree. This time I have a 15 F bag. We were expecting 20 degree temp. The bag passed with flying colors. I was not a bit cold except for my face. Unfortunately I didn’t stay the whole night due to some unusual circumstance. “Yes,” I mumbled. “What’s that?” A loud noise woke me up. I am a deep sleeper. I knew it was gun fire but I assumed must be some crazy hunter doing their hunting at night and was about to go back to sleep. But she didn’t sound too good. Never have I encountered her being afraid of anything. She said something about what she thought was someone trying to shoot at her while she was peeing (or shooting near us) that she saw a car down the road driving away. We were in a secluded area and there shouldn’t be any other but us. So what she said was all spooky. We went backpacking enough and ran into bears or what have you, those things that freak me out but this time she was really scare. I felt she was right outside my tent. I told her let me see if I am dreaming. I know she was about to kill me. I slowly opened up my tent and looked out. She was fine and at her tent. The moon had gone down. Nope this was real she confirmed. By then, it was like already 10-15 minutes after the fact. She asked if we should go home. I said let me get dress first. Unfortunately I was stuck in my sleeping back haft in and half out, while trying open my tent flap. The cold air rushed in. My stupid bag was stuck. It opens on the right ride and I am left handed so I was unable to unzip it. If there was someone trying to shoot at us, we would have been kill as I tried to get out the bag and find my clothing. I knew we had to leave. My friend asked if I was still trying to get dress. yes. Where now are my pants. She asked, were I sleeping naked. No. I am getting there. If I didn’t get kill by bad people, I going be killed by her. Finally after an eternity even to me, I crawled out my tent. My friend wouldn’t let me stand up. We talked it over. She was right of course. We didn’t believe it was hunting at all since it was in the middle of winter and at this ungodly hour and we were on the trail (where normally no shooting is allowed). It wasn’t just one shot but about 5-6 shots. How could we continue sleep through the night to the morning? What if the person come back. For safety, we decided there and then to head back home. We packed as quickly as we could. We kept low to the ground and kept our light off. We hasn’t hiked in the woods yet so our car was next to where we set tents. We tossed everything in the car without much organization. If you asked why we didn’t seek a park ranger or police, it is because we don’t even know where the ranger station was located. We were on a national park, but I think the ranger station is about 10-15 miles away. We didn’t encounter any more problem as we descended from the mountain and we got home by 3 AM. I went back to sleep till the morning. My friend asked if I would be up for another hike near us the next day. Since the night event, we really didn’t want to be defeated and be kept from the woods. We headed to a different local trail and did six miles. So by the time I got home again it was around 4 pm, I didn’t feel like running. It took me about an hour to get warm after getting indoor. By then, I wanted to eat something. PS. To my international readers, America has very few restrictions on owning a firearm. This might alarm you. I apologize I have no good argument except that this is a right guaranteed by the Constitution. We are zealous about this particular right (too bad, we were not up in arm about some other rights like internet privacy). Was there someone shooting at you? I didn’t see anyone (but I got out too late anyway), but my friend saw a car. It was too creepy. I don’t think it was a drive-by shooting. Why would someone targeting us? She had her headlamp on at the time. I think though it was farther away from our campsite, the night just made it sounded closer. It could well have been people hunting? Illegal hunting? That is only explanation we could think of, Someone hunting squirrels in the middle of the night.